I used to wear a bandana to keep the sweat out of my face, since I don't like the idea of wearing a full hat when out running. To me, it feels like a hat traps heat in my head no matter how lightweight and breathable it is. I had been looking for a good, light visor for a while but couldn't find one I really liked until I saw this in a Sports Authority in Chicago. It has worked well for me so far as it is super light (featherlight in fact...so says Nike) and my head stays as cool as it is going to stay with the heat escaping freely. It does a good job of absorbing sweat as well, though on really hot and humid runs it does reach it's saturation point about an hour into a run...even then the little sweat trails just build up on the bill and fly away. 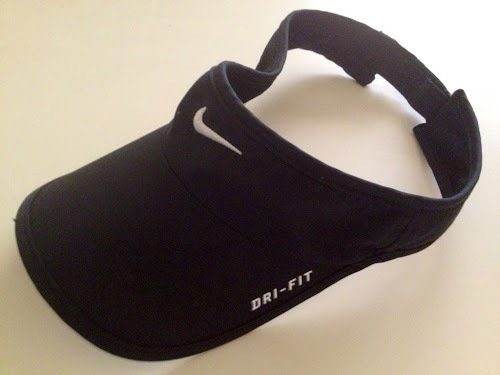 At $20, this is a visor I would recommend to anyone. I started wearing these sunglasses while running on holidays in Mexico this past February. I had been wearing Oakley Half Jackets, but scooped these up before a run one morning. They are actually Michelle's glasses :) She got them in a Sunglass Hut in Key West last year. Once I took them from her she hasn't gotten them back, so I guess I like them. They fit my face well, which is tough for me as I have a smaller head. Most sunglasses are way too big for me. And before any of you say it, these are not women's sunglasses! My only complaint about these sunglasses is they are not polarized, but they do have other colours available and some have polarized lenses as an option. I've looked for a different colour with the polarized lenses a few times in stores but haven't had any luck...and at $160 for a new pair, women's unisex work just fine! I have started to wear singlets over the last month or so as the weather has warmed up and I love them. Prior to singlets, I would usually run in sleeveless tanks and pretty much can't stand a regular tee because they can't contain my huge guns are just a little too constrictive. 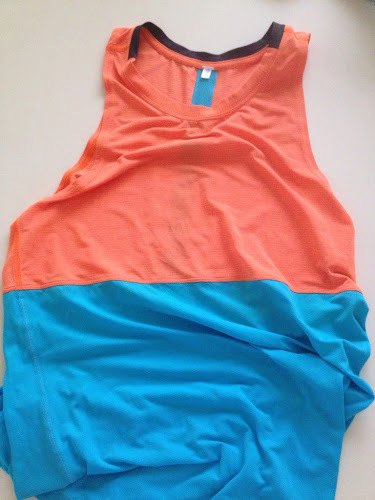 Since making the change though, it is difficult to even wear a tank anymore...though this may just be a product of the crazy heat we've been going through lately. These Lulu singlets are super light and like just about everything Lulu they do a great job of wicking away the sweat. That said, there have been a few long runs where the humidity was just too much and my shirt was drenched...but that would be true of any shirt, so I can't complain. If there was a complaint about these singlets, it would be that they are on the pricey side at $58...although Michelle did find one for me on the sale rack for $34...SWEET DEAL!!! Again, here's something that I've been using for a few months now. 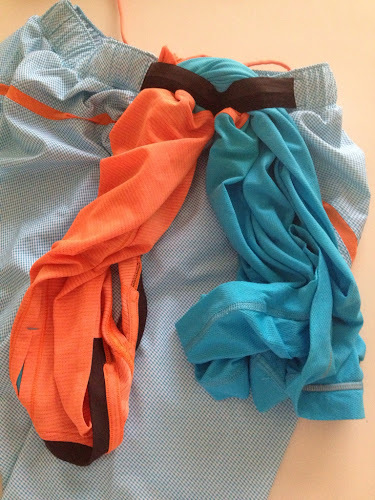 I used to run almost exclusively in Nike running shorts and they are really good as well...but these Lulu shorts have a couple of advantages over the Nikes. 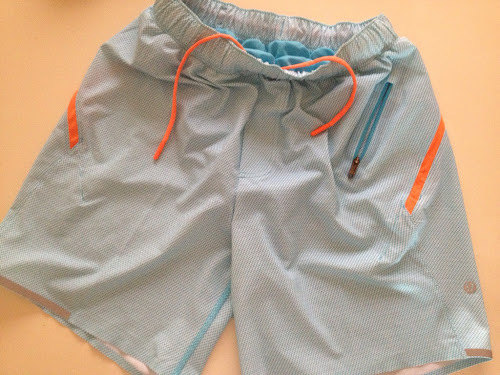 First, the pocket is much better than the pocket on the Nikes as it is large (for a running short pocket), it is easily accessible on the front and it has a zipper to keep your candy gels secure. The second feature it has which I have used quite often in hot weather is an elastic loop on the back to tuck your shirt into. Unfortunately I haven't seen Lulu incorporate this feature into their women's shorts yet I guess I'll just have to be happy with their see-through pants. It is much nicer tucking your shirt into the loop than just jamming it in your waistband. Like most things Lulu, the only real complaint is price as these shorts are $64...but you can always wait until they go on sale. Great socks for running and recovery, I wear my PC socks with almost every run. They come in all kinds of cool colours and there are usually coupon codes floating around that will let you snag a pair for $30. 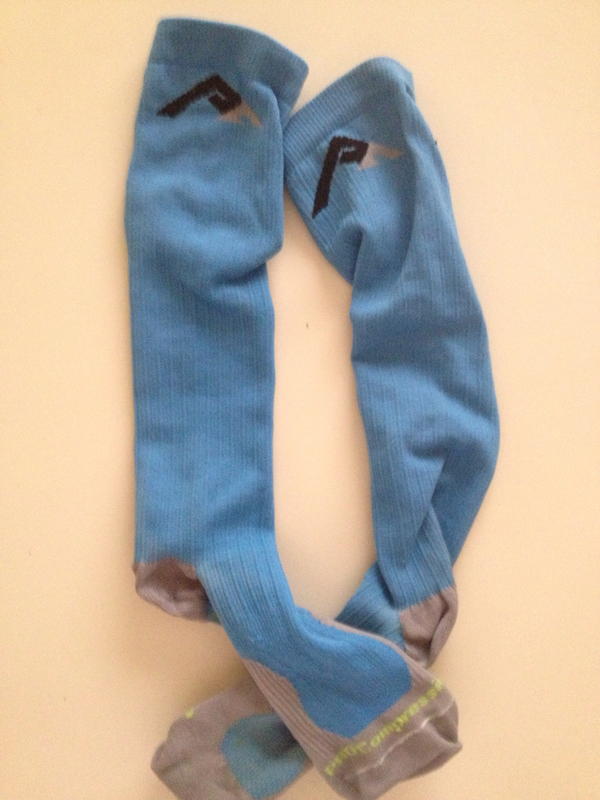 I can't recommend these socks enough, very comfortable and they really do help the calves recover after a tough run. I kind of feel bad only including one pair of shoes and it was a tough decision which ones to use...but I have been running in my Virrata's more than anything else lately. 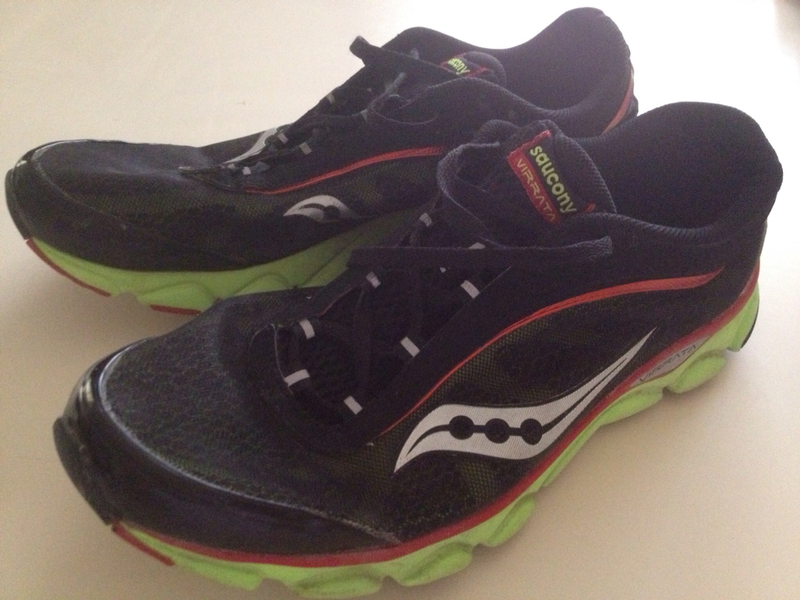 I'm a big fan of zero-drop shoes and these offer a lot more cushioning than the typical zero on the market. I have run as much as 30KM in these shoes and haven't had any issues. They are on for $79 these days at Running Warehouse, and that is a fantastic deal. Currently I am rotating between my Virrata's, Saucony Kinvara 3's and Newton Distance...all three are great shoes that I really like a lot, and basically I try not to wear the same shoe two days in a row. The theory is that is supposed to slow the breakdown of the EVA foam in the soles and let you get a few more miles out of your shoes...whether that's true or not, who knows? Doesn't hurt to try though. 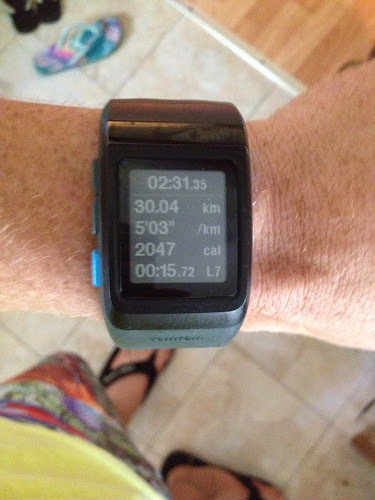 I always run with my GPS watch so that I can stay on top of the all-important stats. The Nike watch does a good job with all of the basic things you would want in a GPS watch, plus it looks good and the Nike site has a nice interface. I got the watch when I first started running though, and I now see that there are a lot more things that I could be tracking and the advanced options on other non-Nike running sites leads me to think that my next running watch will probably be something a bit more advanced. That said, the Nike is a really nice running watch and it does a good job of what it is supposed to do, while at a decent price of $149. 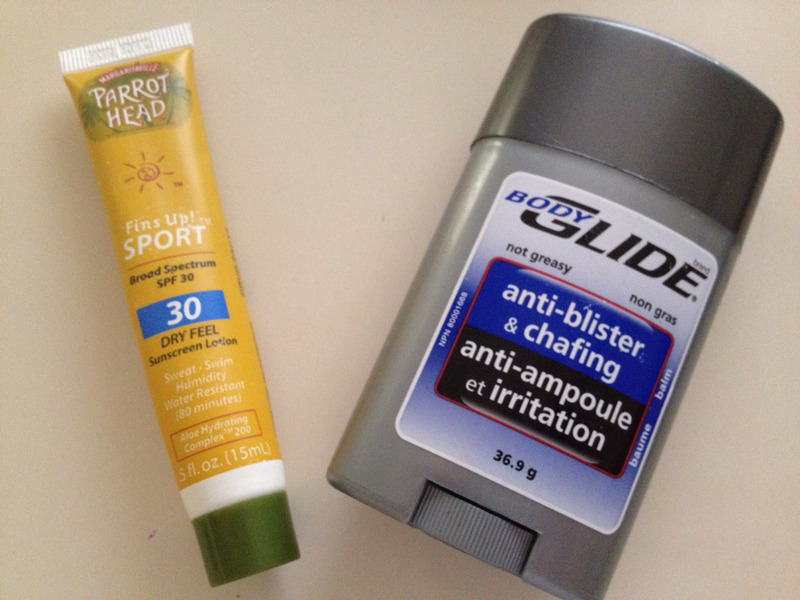 Finally, two other things that I wear on almost every run...sunscreen and Body Glide. Don't leave home without them, especially during the summer heat! What are your essential run items? Anyone out there NOT wearing sunscreen on their runs? Love pro compression! They're fantastic for recovery!! I have them in (almost!) every color. LOVE my PRO compression socks, but I hardly ever get the chance to run outside so sunscreen is not an issue for me. I have to have my phone holder on my arm when I run whether I'm using it for music, time or whatever...It's a must! I've gotten away from running with my iPod unless its my long run. Seems like all the cool kids are big Pro Compression fans! I dig those shades! I need to find some that don't slip off when I'm running. Please tell Michelle not to send hate mail for this, but Nike > Lululemon when it comes to running. I love my lulu skirts, but my Nike gear is lighter, breathable and a bit more comfy. I know. Oh and that body glide is a lifesaver. I really like my Nike shorts, but the Lulu ones had some really nice features for long runs that the Nike's don't. And I have some Nike tops, and at least for men's tops, I don't think there's even a contest between the two...men's running tops Lulu >>> Nike. Maybe I just haven't tried really good Nike tops, who knows?